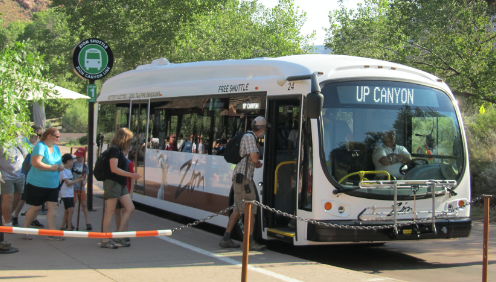 RATP Dev, a leader in public transit, announced it has introduced the first electric bus to the transit fleet at Zion National Park in southern Utah. The vehicle, a Proterra E2, is being used full-time on regularly scheduled routes from August through October. It operates alongside the the current LPG-fueled fleet and is part of a pilot program that suggests a broader plans to introduce more electric units at the park. Continuing with Zion National Park’s sustainability initiative that started in the late 90s, the park plans to transition the entire fleet to electric vehicles. Since the park shuttle system began in 2000, the park’s proactive approach has helped eliminate automobile use in scenic areas and diminish smog buildup in the park’s canyons. The use of electric buses are an attempt to continue reducing emissions, and drastically cut noise pollution generated from the fleet. In that way, visitors can truly appreciate the park’s natural beauty and serenity. RATP Dev has advocated for a three-month evaluation period to ensure the electric bus can support the sizeable ridership and demanding conditions of the park — where temperatures can reach as high as 113 degrees Fahrenheit. Currently, the Zion National Park transit system experiences an average of 105 riders per service hour and operates buses and passenger trailers that can accommodate up to 68 passengers per ride. Thus, every bus going out is entirely filled with standing room only and these conditions are crucial for testing the capabilities of the electric bus system for both at the park, and in other environments across North America. « Will Tesla’s Planned Electric Semi Truck Sport a 300-Mile Range?